Is your carefree soul in need of the perfect outdoor vehicle? Maybe you’re a busy parent trekking to soccer fields and urban jungles? Then look no further than this year’s Toyota Land Cruiser. This colossal SUV, made for robust off-road driving, also spreads the comforts of a luxury vehicle to make this a truly flexible mode of transportation. State-of-the-art electronics keep the Toyota Land Cruiser well-matched -- both on and off the road -- by adjusting the way it travels up and down hills, navigating all types of landscape, and sustaining the proper firmness for hydraulic suspension. See the Toyota Land Cruiser and take it for a test drive here at Lipton Toyota in Fort Lauderdale, FL. Our friendly and experienced sales staff is standing by and ready to greet our neighbors from nearby Dade County and Broward, FL. *Toyota Entune allows for mobile-phone app connection. Pandora music can be transmitted through the audio system. You can opt to put together last minute dinner plans on the go through apps like OpenTable by operating voice commands and steering-wheel controls. Your phone's Bing search can also produce immediate results to the navigation screen. For 2016, the four-wheel drive Toyota Land Cruiser V8 is paired with a new eight-speed automatic that generated an impressive 381-horsepower. The utility vehicle’s locking differential combines with the hardy suspension design to deliver unwavering off-road capability. It will accelerate the sturdy 5700-pound Land Cruiser to highway speeds and beyond as well as skim over slippery rocks far from any city asphalt. The Land Cruiser is a genuine champion in the dirt and sludge. This SUV displays an attitude slope of 30 degrees and a locking center variance that can shift 50 to 70 percent of existing torque to the rear wheels -- depending on the traction requirements of the moment. The rear suspension showcases 9.5 inches of travel to help articulate the wheels over the most precarious geography. EPA ratings for the 2016 Land Cruiser include 13 miles-per-gallon for the city and 18 miles-per-gallon for the highway. 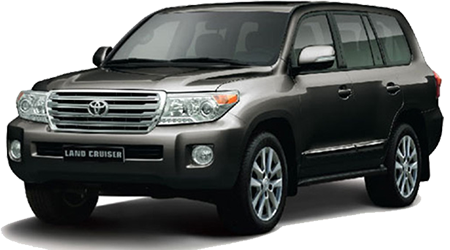 The Toyota Land Cruiser includes an assembly of vigorous safety features, including many fresh, innovative ones. New for this year is a Frontal Collision Mitigation that features pedestrian protection and will engage the brakes to help avoid an accident at speeds under 24 miles-per-hour. Also novel are lane departure warnings, automatic headlights, blind-spot monitors, rear cross traffic alerts, and adaptive cruise control. Another standard component to the 2016 Land Cruiser is Toyota’s Pre-Collision System, which aids by augmenting the restraint operation of the front seatbelts if a collision is imminent. It is also devised to detect other obstacles. This year’s Toyota Land Cruiser includes ten airbags -- among them second-row side airbags and front knee airbags. It also features Anti-lock braking tuned for a range of on- and off-road surfaces, a rearview camera, parking sensors, tire pressure monitors, active headrests, and stability control. Body roll in turns is reduced due to the Kinetic Dynamic Suspension System (KDSS) which fortifies the front and rear anti-roll bars for highway driving and disconnects the bars when the vehicle is off-road. Whether you’re racing through the city or you’re heading for a cross-country adventure, this versatile SUV that includes the high-technology extravagance and comforts of a large vehicle. The 2016 Toyota Land Cruiser was made for sturdy off-road driving, and it’s also a great family wagon. It’s packed with safety features that are backed by Toyota’s reputation for quality and value. You’ll get top-quality customer service and a great price when you purchase a 2016 Toyota Land Cruiser at Lipton Toyota conveniently located at 1700 West Oakland Park Blvd. in Fort Lauderdale, FL Be one of the first from Dade County or Broward County, FL to bring home this handsome family-friendly vehicle.